The Formentera Council's tourism department reports that from Wednesday to Sunday (January 10-13), island representatives will be at the Vakantiebeurs travel expo in Utrecht, Netherlands. Tourism councillor Alejandra Ferrer explained the island has a dedicated stand at the trade fair and a Dutch guide “to share the message of the wonders of our island, not just in summer, but during low-season months as well”. A presentation was given to representatives of more than forty specialised media outlets. 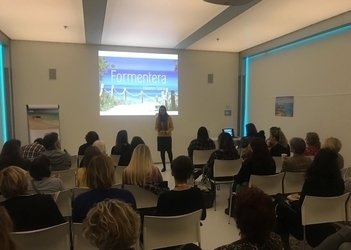 “Dutch tourism is immensely important for Formentera”, said Ferrer, “and together with their French counterparts, travellers from the Netherlands are increasingly picking the island as a destination”. She described the typical profile of Dutch travellers as loyal and respectful of the environment. Ferrer pointed out the direct flights that run between Utrecht and Eivissa and that, with the hand-off on tourism authority already a done deal, Formentera was able to pay for its own stand at the expo.